The fact that this film didn't get an Oscar nomination for best foreign film is ridiculous to me. *Sigh* I may need to write a post about the Oscar nominations, but I'll save that discussion for now. 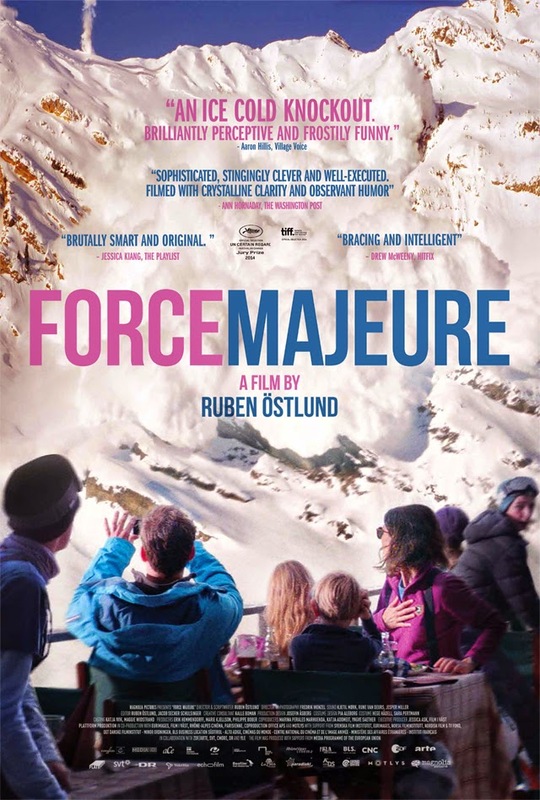 Force Majeure is a Swedish film following a family on holiday in the French Alps. The film begins with them in their ski gear having photos taken. A pleasant picture of the happy family they are. Throughout the film we hear little explosions meant to create controlled avalanches to keep things from getting too out of control. While having some lunch at a rooftop restaurant overlooking the mountains, one of these explosions triggers an avalanche that grows a little larger than expected. It's humorous to see the family and everyone around watching, and trying to figure out if they should be afraid or not. Eventually it grows out of control and gets a little too close for comfort. Once the fight or flight reaction takes over, the father, Thomas (Johannes Kuhnke), makes a run for it leaving the mother, Ebba (Lisa Loven Kongsli) behind with the two children. The avalanche didn't pose any real danger, it stopped before hitting the building, but a frosty mist covered the restaurant. This triggers an avalanche in the family dynamic. As these things go, family problems start small but can quickly avalanche out of control. The event that causes the problems in the first place makes a perfect symbol for familial problems. However even more than that, this film is a bit of a study on the deconstruction of masculinity. Thomas was the one who let his fear get the better of him and tried to save himself rather than thinking about his family. I recall a few years ago ESPN showed highlights of a baseball game in which a foul ball fell toward a couple. The man initially reached for the ball, but out of fear eventually retracted his hands to duck and cover letting the ball hit the lady. I wonder if what happened in the following days was anything similar to what we have in this film. That split second decision in the face of fear and danger is seen as a test of character. No one really knows how they'll react until something like this happens. After things clear up at the restaurant, Thomas, and everyone else who ran, head back to the table and the family continues their meal in an awkward silence with Thomas attempting to make light conversation to ease the tension. They go skiing, and afterward there is a great shot where everyone is separated on a moving walkway heading toward the camera. They each pass one after the other. A visual representation of the separation forming. Before the incident the film features shots of the parents separated by the kids standing in the middle (another common theme is the parent's inability to have a moment alone together). After the incident we don't see the family all together in one shot. Later that evening the mother and father have dinner with some friends, and the story comes up. Perhaps this is not the right time to bring up the subject for the first time, and it's as awkward as you'd expect. Thomas doesn't want to lose face, and feels it necessary to defend his pride. He refuses to acknowledge the event. Ebba struggles as much with the fact that Thomas did what he did as the fact that he refuses to admit it and apologize. In a later scene, Thomas and Ebba invite family friend Mats (Kristofer Hivju), and his young girlfriend Fanni (Fanni Metelius) over for dinner. By this time Ebba is on the verge of an emotional explosion, and having no chance for a conversation away from the kids, these dinner gatherings are her only chance. Mats and Fanni return to their hotel room for the evening and further discuss the situation. Naturally their discussion turns to, "what would you have done." Fanni accuses Mats of being too similar to Thomas, and the couple argue all night. This scene continues the deconstruction of masculinity. It's a bit of a role reversal within our perception of gender characteristics. Fanni just wants to sleep, but Mats is the nagging one who can't let things go. Force Majeure, technically speaking, is an exercise in long takes. I'm a fan of long takes, and it's becoming a lost art in film. Östlund does a good job of letting a scene play out without unnecessary cuts. Successful long takes are always a credit to the acting and directing, and both are great here. The film is most certainly a drama, but there is a subtle humor to it all as well. It's handled effortlessly. Östlund is clearly aware that sometimes being a fly on the wall watching a family interact can be both dramatic and humorous without adding jokes or slapstick moments. My only problem with the film is that it might be two scenes too long. There is an emotional climax that feels satisfying enough, and then we're given two extra scenes meant to wrap it up with a bow on top. It's an obvious redemption scene, and then a scene meant to balance the scales. Both come off as a little too contrived to work, but don't, however, in my opinion, lower the quality of the overall film. Again, Force Majeure is one of the best foreign films of the year and it's a shame that it's not being honored with a nomination for an academy award. It's available to rent digitally, and is coming to DVD/Bluray through Magnolia pictures (here in the US) in February. UPDATE: It's also now available for streaming on Netflix.